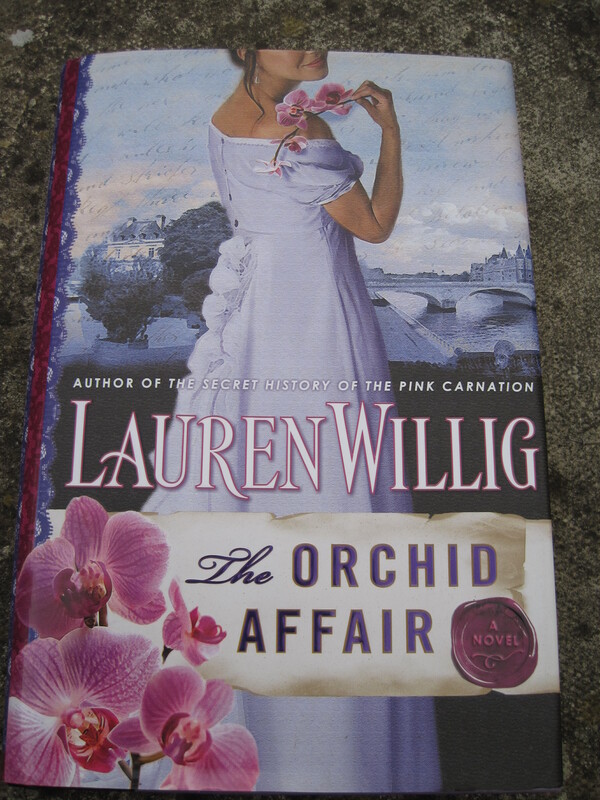 This week’s BotW is Lauren Willig’s The Orchid Affair – the eighth book in the Pink Carnation series. It’s been nearly two years since I read my last Pink Carnation book and I’d almost forgotten how much I enjoy them. One of the really good things about this series is that Willig has come up with a way to generate plots that doesn’t involve breaking up couples that you love. In part eight, we meet Laura, a governess for more than a decade, who has been recruited to the Pink Carnation’s spy network watching Bonaparte’s Paris. She’s got a post in the household of Andre Jaouen – the right-hand man to the Minister of Police. He’s part of an investigation is underway into a royalist plot – and Laura’s charged with reporting anything suspicious. But, as always, things are more complicated than they seem. Meanwhile back in the modern day, Eloise (the historian who is researching the Carnation’s network) is due to meet Colin’s mother. This is a fun romp through Post-revolutionary France – with likeable characters and a gripping plot. There’s a great balance of suspense and romance – and although I would have liked to have seen a bit more of Colin and Eloise, I appreciate that Willig is taking her time with those two and not rushing them into things – and that more of them might have slowed the pace of the rest of the book. My only real problem with this book was that the copy that I got is the US edition and so it was in American English – not British English – which in books like this yanks me out of the narrative abit (sometimes to Google things – like AP French). But hey, when you have a backlog like mine, and strict rules about book spending you can’t be picky. And it’s a very minor quibble really. There’s another three Pink Carnation books I haven’t read yet – with a twelfth and final volume due this year. I suggest you start at the beginning so that the Colin and Eloise thing works best for you, but really they all work quite well on their own. Although you may not get the running jokes. The Orchid Affair is available from Amazon, Waterstones and Kindle – but I don’t think there’s been a UK edition, which can make the prices a bit.. high (hence why it’s taken me two years to get to the Orchid Affair). But the earlier books in the series did get a UK release, so you should be able to get your hands on them – I got the first couple from my local library. Regular readers know that I like matching books. I have a couple of this series on my kindle (and the novellas), borrowed a few from the library, and then started buying. 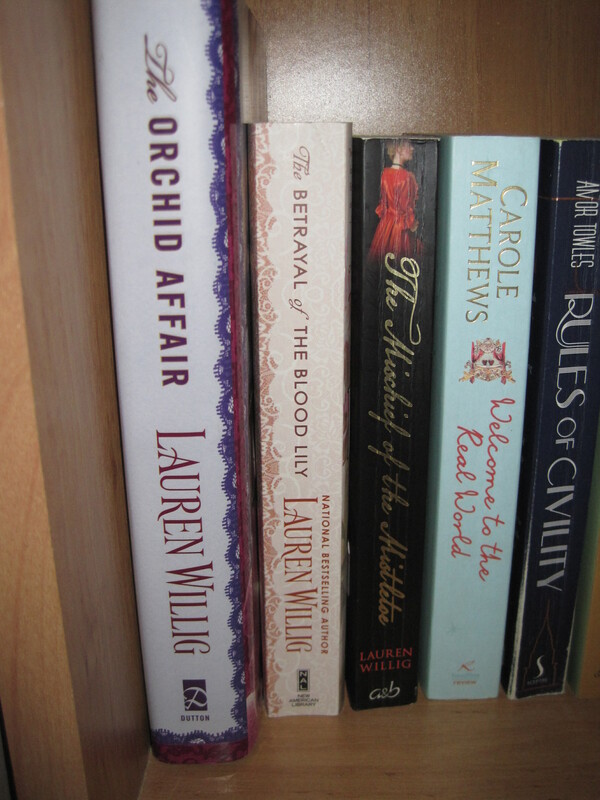 But due to the vagaries of the book market, I have three different sizes and styles of books – out of three. There isn’t a way to shelve this and make me happy.